Since 2015, a multidisciplinary project team has taken the proposed pathway project a step further, digging into design details and performing advanced feasibility studies and preliminary engineering to determine whether various technical challenges can be overcome, and to refine cost estimates. A wide field of possibilities were narrowed to six preliminary designs that in 2016 were presented to the public and stakeholders. The preferred design alternative, developed in 2018, was presented to the public on November 19. It features an alignment running along the north side of the West Span with a touchdown in San Francisco at Essex Street (parallel to First and Second streets, between Folsom to the north and Harrison to the south). The recommendation for the Yerba Buena Island connection joins the East Span path via Southgate Road along the east side of Hillcrest Road. The path would share architectural features will the East Span path, providing continuity of experience along the entire crossing. The biggest challenge, however, remains financial. Estimated costs for a project of this type run into the hundreds of millions of dollars. No source of funding has yet been identified. Initial studies conducted as early as 2001 and again in 2014 looked at the feasibility of building a path on the Bay Bridge West Span. But the first rounds of pathway alternatives studied were either too pricey to even consider, or lacked enough design to get a proper cost estimate. The project team is now recommending a preferred design alternative, with an alignment running along the north side of the West Span, with a touchdown in San Francisco at Essex Street. The recommended alignment for the Yerba Buena Island connection is from Southgate Road along the east side of Hillcrest Road. Although the proposed design addresses the technical challenges of adding a path to the span, it still faces funding challenges. Estimated costs for a project of this type run into the hundreds of millions of dollars. No source of funding has yet been identified, and the project cannot be financed under the current toll structure. Even if a funding source can be identified, construction of a West Span bike/ped path could be a 10-year project from start to finish. This includes up to three or four years to complete preliminary designs and environmental review, two years for final design and right-of-way acquisition, and then up to four years of construction. 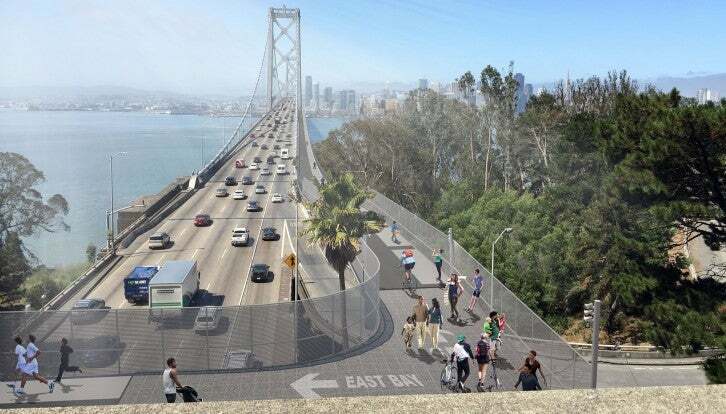 Watch a recording of the presentation and Q & A portions of the West Span Bike Path meeting, which was held on November 19, 2018, from 6 to 8 p.m.